Finally found a yellow finger gorg (Diodogorgia nodulifera). My last one didn't make the tank transfer from the 110 to the 60 (after i moved to new tank - couldn't get polyp extension). I have a few of the red ones. Have been looking for this for a while and got it at a decent price too! Getting good polyp extension which is key. 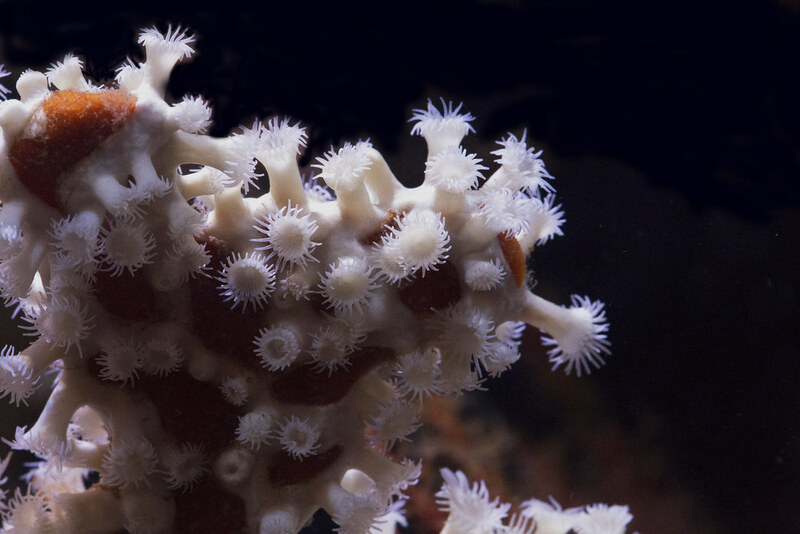 I find the white polyps to be beautiful. Broke down and bought one of these. Great....i can't take my eyes of them. 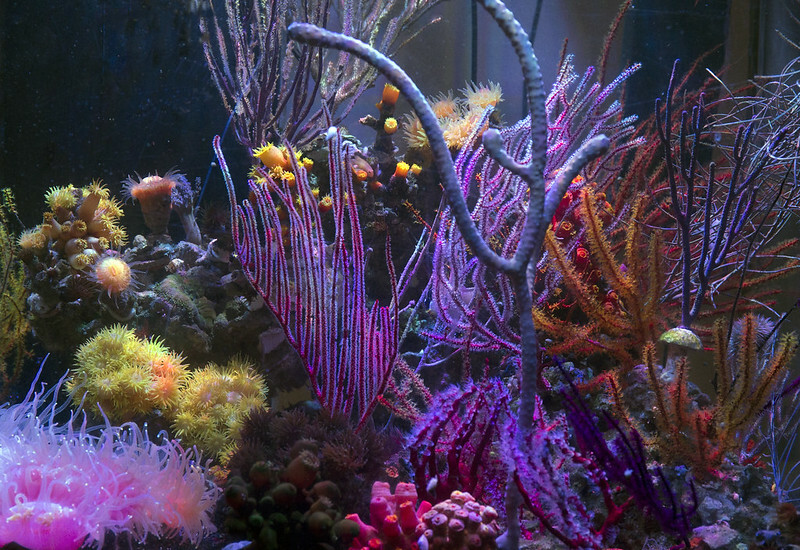 Your tank is currently my favorite eye candy on the site. Thanks a ton. 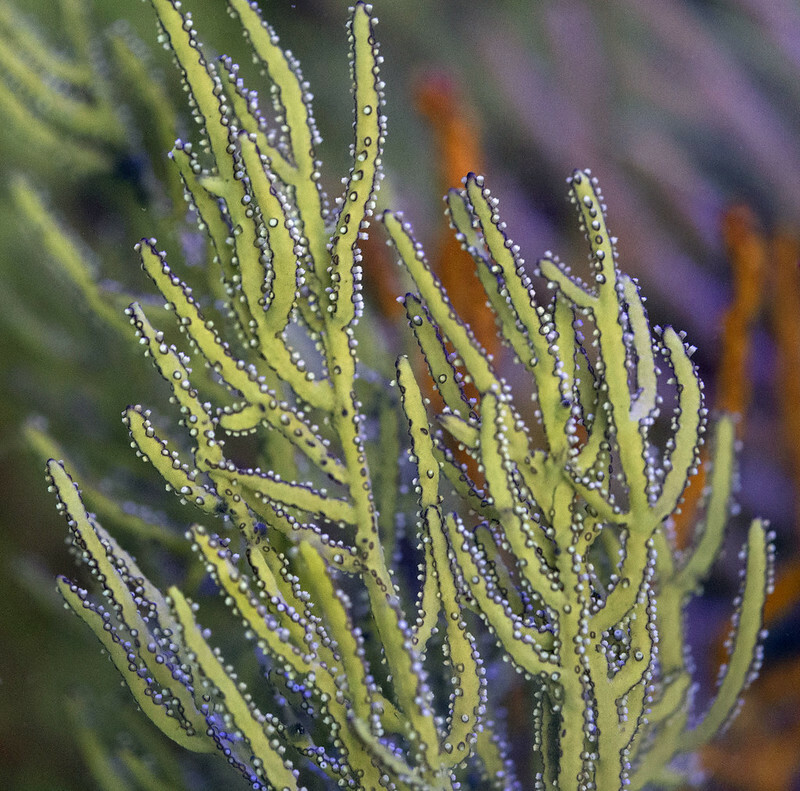 Am I correct to think that the pink corals in the lower left hand side of your picture are rhizos. They are so beautiful. They look better in that picture than in earlier ones. Is that because they are just more mature at this point? They are Rhizo's - 6 in total and you are right they are quite large now. Trouble is they will sting everything they can reach. Haven't posted in a while. Lots of changes since the last update. My original 60 gallon NPS tank got scratched pretty badly thanks to the younger children in my family who were over a couple of xmas' ago and found that the most amusing thing about the coral tank was dragging the magnet back and forth. Unfortunately the MAG had pieces of gravel trapped. Have to say i was a bit disappointed in how easy the tank scratched. Anyways I commissioned a custom build with a local builder. This tied into a reno I had at the house. To make long story short everything took longer than it should and I ended up housing the NPS corals in my 110g for way too long. Ended up losing my dendro colony (the orange branching ones and a few of the Rhizos. My 110 has a baby trigger in it who likes to go after the food in the Rhizos and ended up ripping the flesh out of a couple. Mostly everything else is still around. Anyways, the reno is finished and I now have plumbing that goes from the upstairs areas where the display tanks are going to be to the basement which will be a central sump / filtration including a LaCl reactor (building it myself). The new NPS tank will be a 30x30x24 (built already). The 110 will be replaced by a 84x28x30 tank. They will be plumbed together. 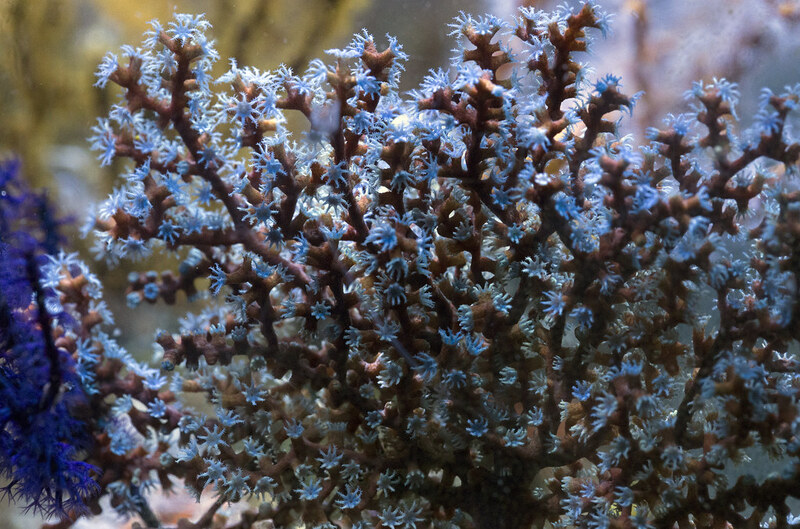 The new display tank will be LPS/Soft corals oriented. Where I am in all this is that I have the NPS tank and stand built. I will probably work on the cental sump/filtration over the holidays and then replace the 110 (the new tank is being build). Not really into "build threads" but I thought I would share some of the details. this is the plan for the stand. A couple of the features in the stand include - a water proof shell on the bottom - the entire bottom has been sealed using silicone so any leaks from the sump gets trapped. There will be water alarms both tied into the home security and through Apex. Motion detector switches for the lights inside in the sump area. Last edited by noy; 12/17/2017 at 12:38 PM. I plan to have a "flow-through" sump with a emergency skimmer in case there is some issue with draining/pushing water from the basement. This is going to present a challenge as I will have to figure out some way so that the local probes and sensors can communicate with the controller in the basement. I have have localized control using an Apex which will be attached to the tank upstairs. Thinking of using a Arduino (either stand alone or using a Reef Angel) as the basement main control. I may have to setup RF transmitter/receivers with the upstairs probes so it can send the tank parameters to the basement. I will do a few updates as I set up the basement filtration. Hopefully we can get to the fun stuff (livestock) soon! Welcome back noy and sorry to hear about your losses, but your new plan sounds exciting. And that setup is really clean can't wait to see the new tank up and running. We hope to see again another beatifull NPS tank. Any updates on the builds or pics of new tanks? Wow really amazing Gorgs! 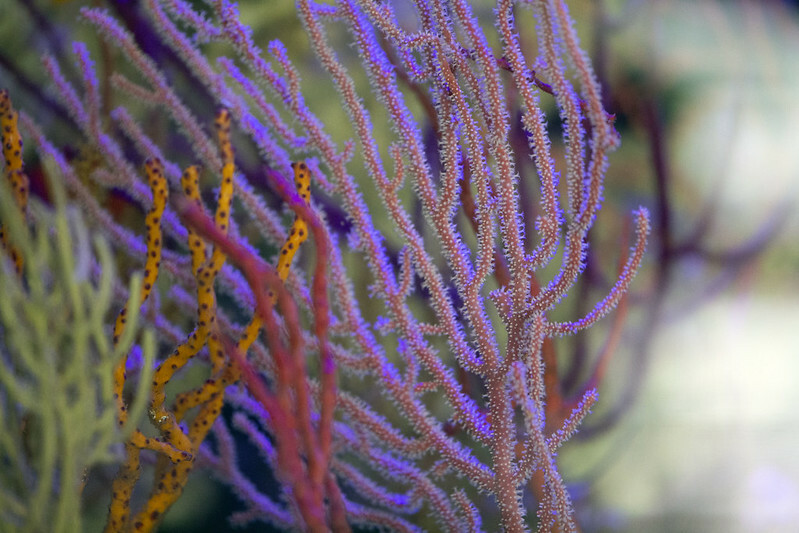 Do you still have that Harp Gorgonian? I've been trying to find that one. I have a little anecdotal input on my Spider Sponge. I have found that they seem to need a lot of flow. When I first put it in the tank, it blew over so I put it in a calmer spot but it slowly started to decline even though I was feeding it a lot of varying foods for NPS. 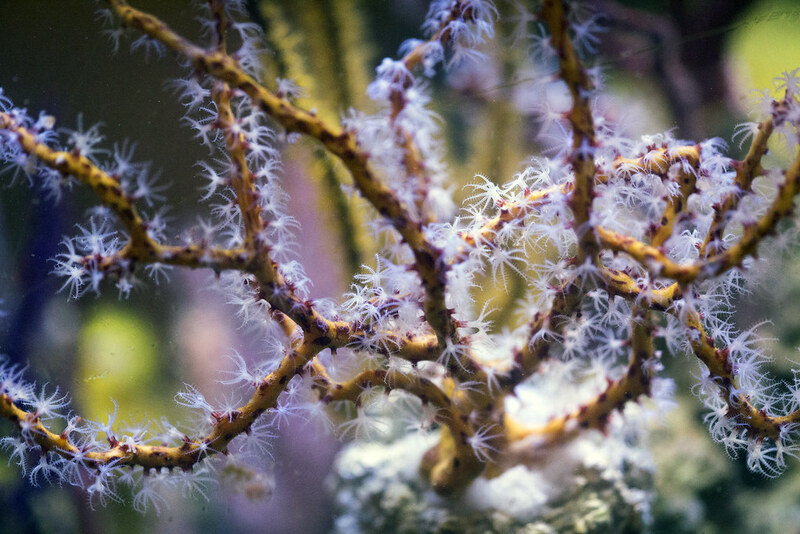 The polyps weren't coming out as much, month after month and a brown film was starting to form near the center of the branches. That is when I moved it right into the thick of flow. I happen to use a Neptune COR with a 1 ¼ inch outlet and a Gyre, both on the left end. I programed them to ramp up and back down about every 30 seconds but I don’t think that is a big deal. I don’t know. In my 6 foot tank. I put the coral about 4 feet away so that the flow would be more laminar and then turned up the flow enough to get it to bend slightly. Within a few minutes, it started to perk up and in hours it looked much better. 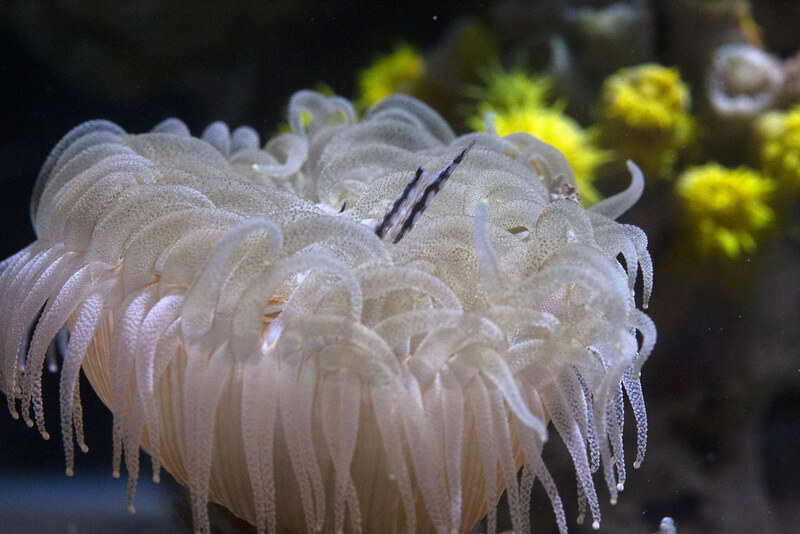 In just about a week or two, it had shed the brown film and now the polyps are out most of the time, day or night and regardless of feeding. This might be a coincidence but it seems to be working. Noticed a lot of movement at the bottom of the tank. Check up close - realized shrimps (probably the cleaner shrimps) had a hatching. Excuse the dirty glass - its at the bottom of the tank. if anyone has ideas on raising these let me know! Last edited by noy; 02/26/2019 at 07:43 PM. Not quite sure what this is. Originally thought it may be Pterogorgia guadalupensis. 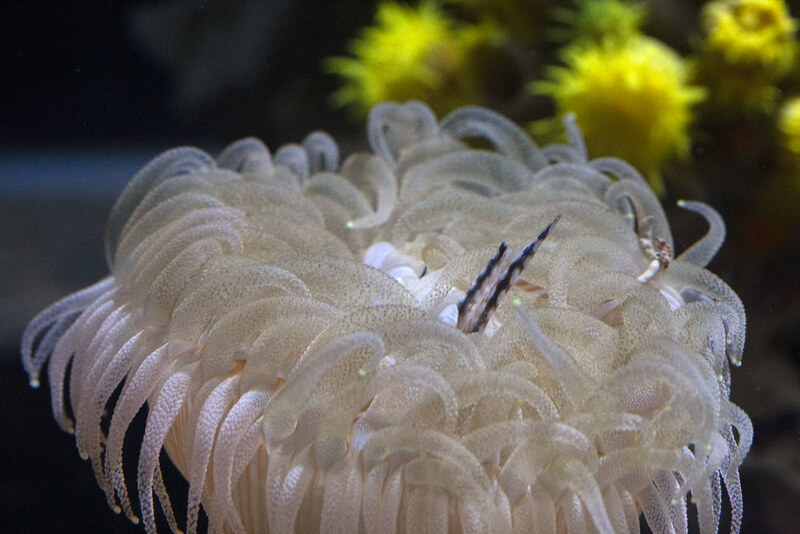 However the white polyps really threw me off. 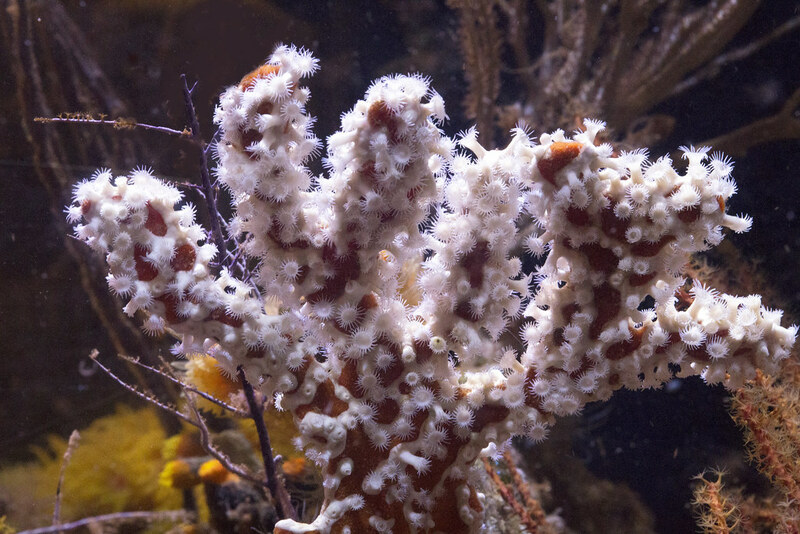 P. guadalupensis usually have brown polyps. 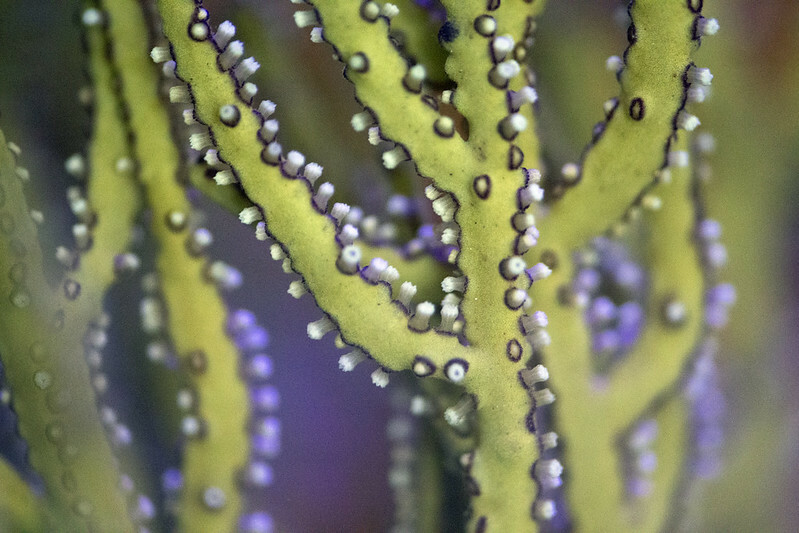 White polyps generally mean non-photosynthetic. Thought it may be Pterogorgia cintrina but the polyps are too small. Didn't get very good collection information from the LFS. 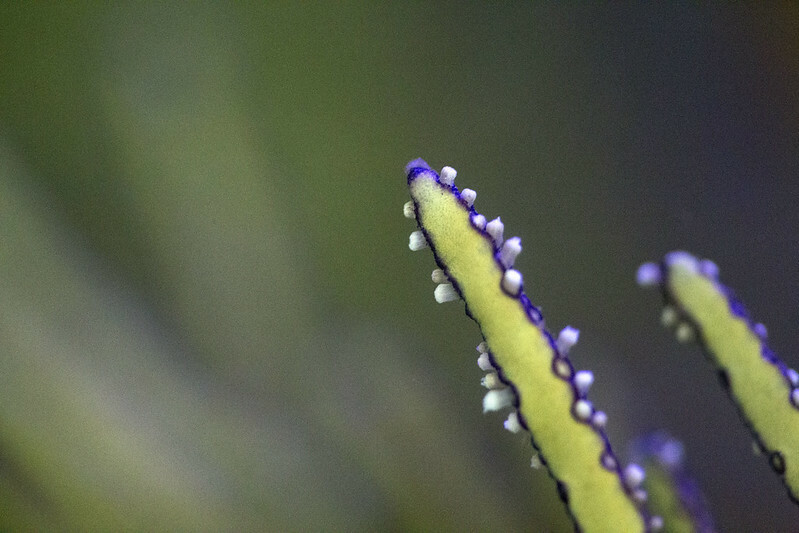 Following are 2 close up shots of the polyps. Swittia exserta. This is a replacement - I had a colony of this and lost it to a very particular parasite which seemed to only attack that gorg in my tank. Had it for over 2 years and showed no decline. 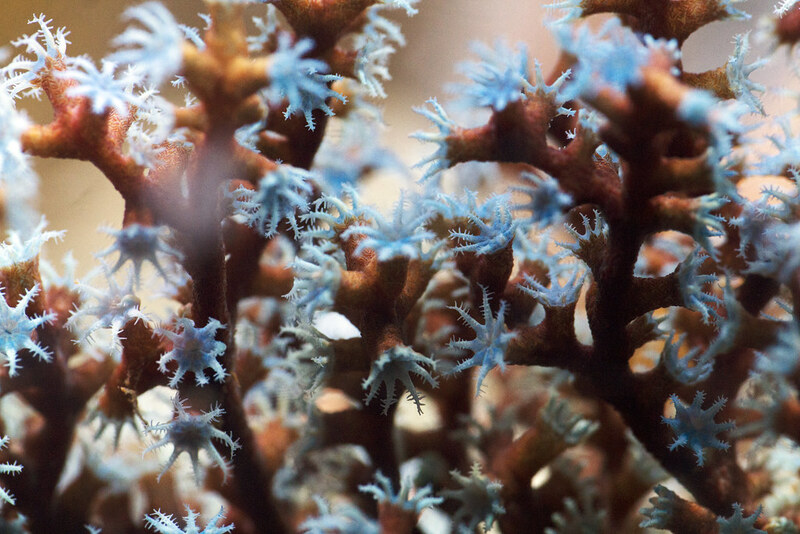 Not really new but I just love this coral. 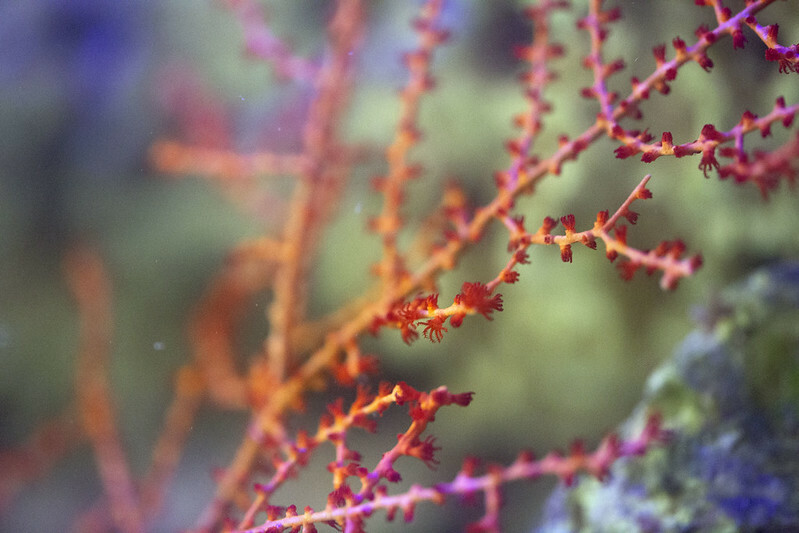 Gorgonia sp. 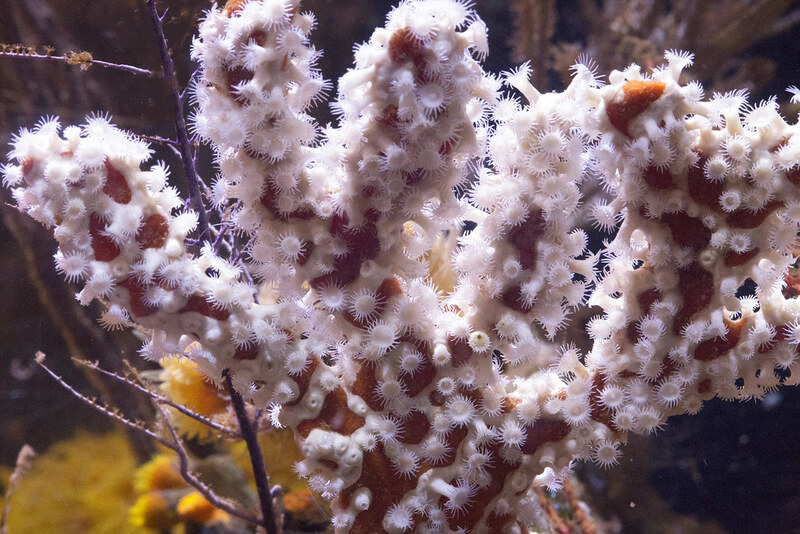 Thought it might be lophogorgia chilensis but all the pics i have (except one) show red polyps.